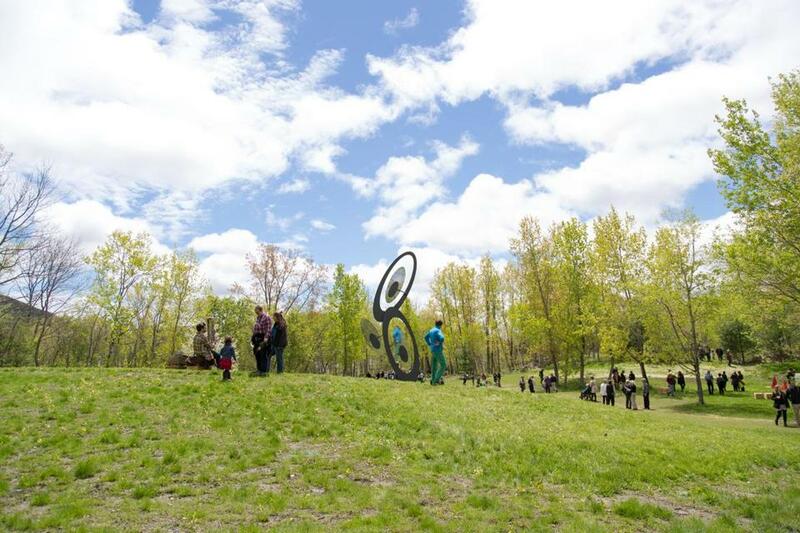 Turn Park Arts Space — a new sculpture park and cultural hub in West Stockbridge. WEST STOCKBRIDGE — This quaint Berkshires town lies just over the ridge from the pristine emerald lawns of Tanglewood. But here, the vibe is a bit grittier. Until recently, right in the village center, near the post office and a popular local eatery, there was an abandoned old limestone and marble quarry, a reminder of the town’s bygone industrial past. Not that locals seemed particularly sentimental about the spot, which had been in use mainly for underage drinking, walking one’s dog, and dumping one’s trash. But happily, over the last three years, the quarry has been transformed — the landscape restored, the mining detritus cleared away, and more truckloads of garbage removed than anyone can count. From the rubble has emerged Turn Park Art Space — a new sculpture park and cultural hub. On a recent Saturday, the scene was one part Berkshires pastorale, one part Fellini, one part Weimar cabaret. Knots of visitors ambled across the site, blinking into the sunshine with looks of curiosity and evident delight. Near a cliff overlooking a small lake, a pop-up outdoor performance of “The Drumf and the Rhinegold,” a Wagner-Trump operatic parody, was underway. A soprano in the role of Melania Trump could be seen standing, clad in a luxurious white robe, arms outstretched, reaching for a floating aureole of orange hair, a Trumpian wig, being held aloft on a giant stick. Nearby, a burlesque dancer twirled acrobatically on a pole. And a small orchestra sat beneath the trees filling the air with earthy yet tuneful music. As the singers performed in different locations, the audience migrated across the meadow with them. The musicians migrated, too. And nestled among them, easy to miss, was a man in a T-shirt with kind eyes, pushing a piano on a platform with wheels. He was smiling. And with good reason. For Turn Park cofounders Igor Gomberg and his wife, Katya Brezgunova, the park’s recent opening represents the culmination of a dream they have tended across decades and oceans: to build a vibrant gathering space, an unstuffy place for community, for art, and for creative ideas. Their vision grew out of their own past life in Moscow, but it had its roots deeper in Soviet history, and in the story of one particular modern sculptor named Nikolay Silis. Born in Moscow in 1928, Silis, who is renowned in Russia but little known outside of it, lived through the darkest years of the Soviet experiment. His own father was executed in Stalin’s reign of terror, and he came of age as a sculptor in the 1950s, during the heyday of a stultifying Socialist Realist doctrine in the arts. Silis pooled his oppositional energies with two other artists — Vladimir Lemport and Vadim Sidur — and the trio took refuge literally underground, setting up work spaces over the years in a series of boiler rooms in the basements of old Moscow apartment buildings. Their studio became a legendary gathering place for the Moscow intelligentsia. In one published recollection, the filmmaker Yuli Fayt recalled an early visit with his own father in the 1950s. Gomberg did not meet Silis until decades later, in 2000, by which point Silis was the only one of the original trio of artists still alive and active. In fact, he was still working from his Moscow basement studio. Needless to say, the world above ground had changed profoundly. The air below had not. “In the new Russia, this studio was a different space,” said Gomberg. “It was like a short breath of freedom,” added Brezgunova. In an era when stores like Gucci and Christian Dior were opening on Red Square, Silis had still preserved a particular Soviet-era style of refuge, a way of finding solace in shared food, shared drink, and shared conversations about art, life, and the world of ideas. Gomberg, who was trained as a mathematician and now works in high tech, decided he wanted to help Silis by purchasing his sculptures and displaying them abroad. He and Brezgunova, a screenwriter, bought land for a future sculpture park in a small village near Prague. Local residents, however, were less than welcoming. “They asked us to put up an 8-foot concrete wall around the property,” said Brezgunova. Not a good sign, they thought. So the sculptures they had purchased remained in storage, and eventually the entire family immigrated to the United States, settling in Newton in 2012. Gomberg and Brezgunova spoke with new friends about their vision for an arts space. Somebody suggested the Berkshires. And so, in the footsteps of another Russian some decades earlier by the name of Serge Koussevitzky, they headed out for a visit. It only took one trip. “We saw the cliff and the lake here, and thought this was fantastic,” said Gomberg. “We thought it’s good for an arts place to be dramatic. We also wanted a space with something of the soul of Silis’s basement studio — and we saw some of it here.” Fortunately, this time, the local community was ready and welcoming. Fast forward three years and the space is indeed unrecognizable from its former state. The rock piles have been consolidated onto 8 of the park’s 16 acres. A new gatehouse has been built, at once modern and mindful of its surroundings. A walkway on its roof is curved to echo the ridgeline of the nearby mountains. Visitors stroll down pathways and over knolls to view the collection, which now features four works by Silis as well as sculptures by Lemport, Ukrainian artist Nazar Bilyk, Austrian artist Vadim Kosmatschof, and the local American sculptor Gene Montez Flores. Turn Park plans to continue growing the site, its collections, its programs for families, and its temporary exhibitions, which presently include a show titled “Wooden Forms: Ben Butler and Jim Holl.” Its musical plans are also ambitious, with the composer Matti Kovler, who wrote the Trump-Wagner farce, curating weekly pop-up performances. Salerno, the town historian, shares Kovler’s enthusiasm for the new site. But even he can’t quite explain one abiding mystery about its past. The quarry has always been located on a street called Moscow Road. Yet no one seems to know how it got that name. Gomberg and Brezgunova chalk it up to a happy coincidence. Or maybe something more. “Art,” Silis has written, “is the realization of those freedoms and possibilities that were left open to us by previous generations.” With Turn Park’s idealism, its informality and its communal vision of a gathering space built around creativity, those words are now finding their echo here on Moscow Road.